Children usually like to do hands-on activities and use Lego blocks. You can use the bricks to teach math, language arts, science, and history in a fun way. Legos can be used for math hands-on activities. First have your child sort the blocks. 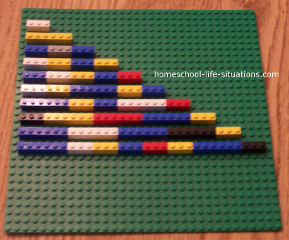 Your child could sort by color or by the number of dots on the bricks. If you have young children who might place the blocks in their months you could use the larger Duplo blocks. You can also use teach about math patterns with Lego. We have red, black, white, yellow, and blue blocks. You could make a simple AB pattern with two colors or use three colors for ABC pattern. The blocks can be used for a math manipulative. Give your child a handful of blocks with at least two different colors and a math worksheet. Have your child use the blocks to find the answers to the questions. When he is done doing the worksheet he can use the blocks to build something. There are several hands-on activities that you could do for multiplication. One is to use the bricks to show the times facts. I did one to show the threes facts up to three times ten. I had to use blocks with six dots because I did not have enough of the smaller blocks. Your child would have to know that the six dot block equals three times two. You could do similar multiplication activities using the one, two, four, six and eight blocks. If you wanted to show other numbers you would have to combine blocks. Another way to teach multiplication is to give the product and tell your child to arrange the blocks on the base piece so that the dots equal the product. You could have your child use blocks for graphing. If you keep track of the weather use the yellow squares to represent sunny days, black could be rain, and blue could be snow or your child could decide what colors to use. Snap each color together. Lay the rows of blocks side by side. Compare the different types of weather. Make sure that you use the same Lego shape for each of the items that you are graphing. Finding hands-on activities for language arts is hard. 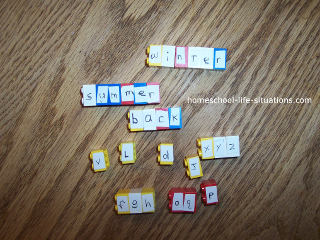 Use Lego blocks can make spelling and grammar fun. To use the blocks for spelling you will need to copy letters onto sticky labels. I used a marker to write the letters. You could use a computer and print the letters onto labels. I used square blocks then added the letter. If you place the letters so that dots are on the left side you will be able to snap the blocks together to make words. I learned how to use the Lego blocks to diagram sentences when I was in college. You will need a base piece and different colored blocks. Each part of speech was assigned a color. Then on a base piece you would diagram your sentence. If your child likes to read interesting facts there is a book about Lego. The Ultimate Lego Book by DK has interesting facts about the history of Lego, how blocks are made, and about the theme parks. There are several educational Lego sets that can be used for science. When I was on Amazon I saw a rocket set, a physics set, and an electronic snap circuit. There are also robots that you can build. We have had several historical themed sets when my children were young. One was a medieval castle and the other had a western theme. Today there is a set called Educational Fairytale and Historical Mini Figures. The set has 22 different figures. Some of the figures may be objectionable. I would remove from the set what I did not want my children to play with. Lego blocks can make learning fun with hands-on activities.